« Who Are The Ad Wizards Who Came Up With This One? The decision scales my tip to favor Bill Richardson for the position of the Secretary of State. While Hillary Clinton is a political heavy-weight, Bill Richardson will bring a lot more gravitas to the job. 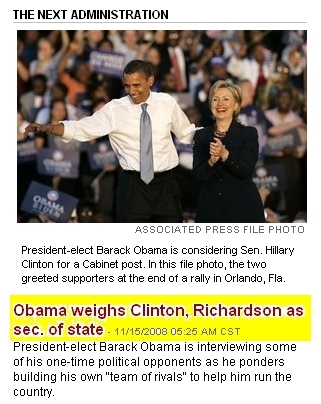 Richardson’s hefty diplomatic experience adds mass to his candidacy but Clinton’s political prowess and name recognition puts her in the same weight category. A weighty choice indeed.